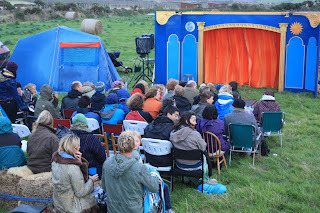 On Saturday 10th September the Family Album theatre company performed their new show "Dusk to Dark" here on the farm. 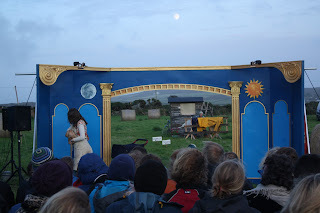 The "stage" was a piece of Home Field as viewed through an ornate archway, with the moon rising over Bartinney Beacon behind, providing a lovely backdrop to an excellent performance. 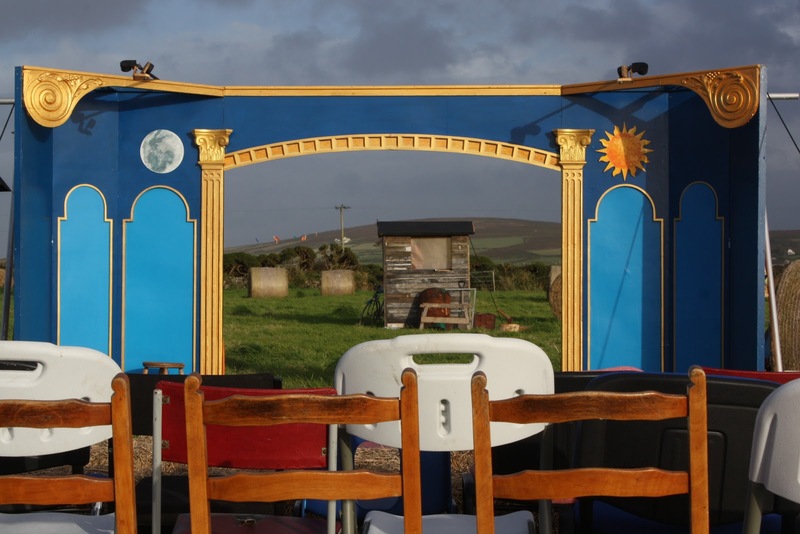 The outdoor "stage" using scenery as a natural backdrop. 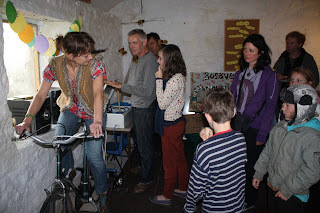 Before the show began, as people munched quiche, tortilla and cakes made from the farm's own eggs, entertainment was provided by a pedal-powered stereo system in the Hive. 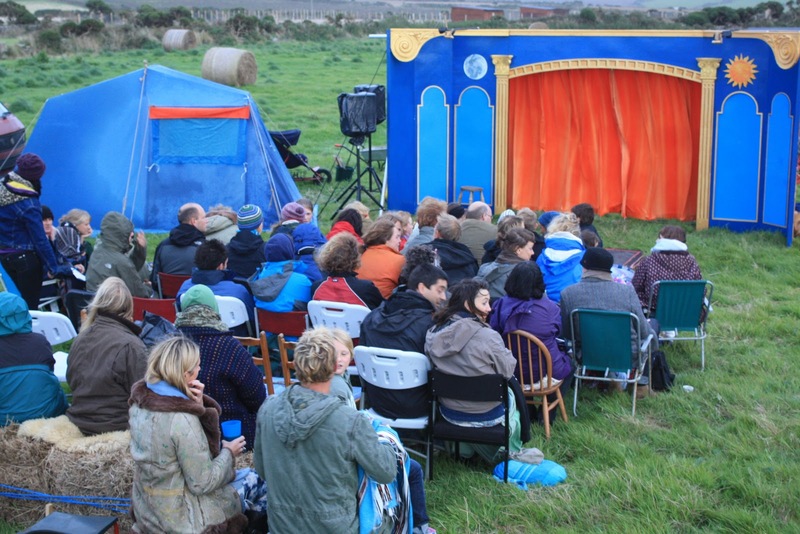 As dusk approached the audience took their seats, and the show began, being a tale of love and irritation set on a campsite somewhere in West Penwith. The natural dimming of daylight provides inspiration for the show and its title, and is used as an effect on the "stage". Audience awaiting the start of the show. Partway through the show, as darkness approaches. Many thanks go to Neil, Kelsey, John and Lollie for putting on a great show, and for everyone who came to watch. What's selling now at the farm gate? The shed is open from dawn (well, 07:30ish) till dusk every day, and we'd love you to shop there! Many many thanks to Katie from Seattle, who set off to south Wales today to continue her wwoofing experiences there. 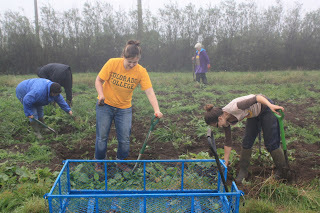 Katie was with us for just over two weeks, and worked hard out on the farm and in the kitchen! Have a great time in the UK and in Europe, and thanks for all your help. 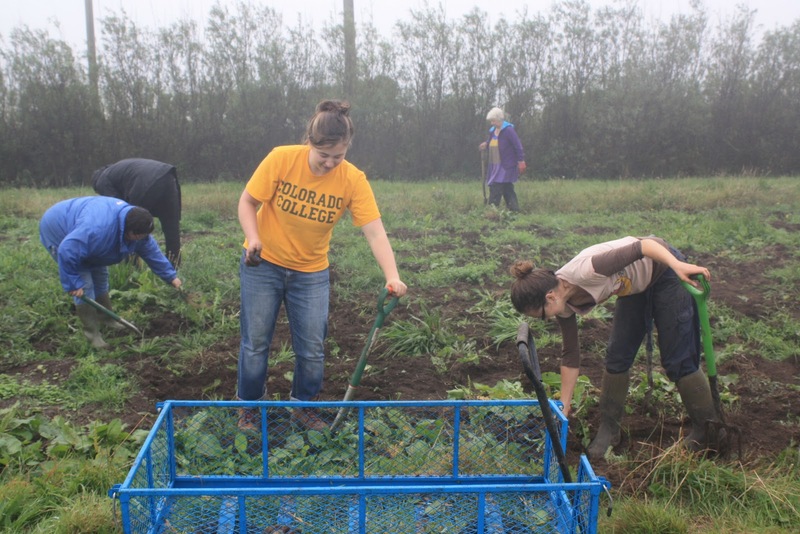 Katie (centre) digging dock roots out of the vegetable field, along with Anne, Jim, Sonja and Becky. Land's End Peninsula Community Land Trust Newsletter. 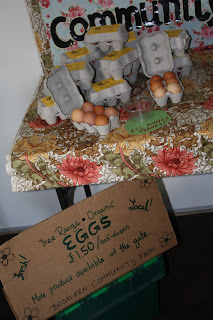 If you have been down to the farm or visited the stall at Pendeen Farmer’s market you will know that the volunteers have been working full tilt to get an array of fresh produce out. Veg has varied from potatoes, tomatoes and beans to garlic, herbs and other salad things. too and see how they are reared. Whether driving past or visiting, you will have noticed hay being cut and baled. Small bales are available for £3 each. The fields we are not using are now being rented out so you will be seeing some organic cattle there. The other task taking the time of Deb, Rob and other volunteers is getting the Lottery application completed. Cornwall Council have agreed to give us the first option on buying the farm (brilliant news) but wants to see that we are going to have the money to do so by 31 March 2012. So please, please if you want to see the farm kept to be run by the community for community benefit then put us in touch with people who may be willing to consider making a donation or a social loan. If you have ideas for the farm, are willing to organise a fundraising event or just want to roll up your sleeves and get involved on the land or in the office then get in touch. All skills and ages can be accommodated! As chair of the Trust and a bit of a softy, I had a single chick hatch in our incubator. Bosavern came up trumps and provided a foster mum, in the form of a broody hen. Well she has done her bit raising the chick but is remaining with us and has become a real adventurer! It does not matter what we do she will not lay her eggs in her house; she has to hop over the hedge and wander into our garden to lay. She has wandered into and right through our house, when my husband left the top half of a stable door open. Her biggest adventure took her to Hayle (from Carnyorth). On this occasion she managed to stow away in my husband’s truck. Imagine our shock when we reached our destination and found Bosavern hen! After trialling our organic veg boxes with friends and volunteers over the summer, they are now ready and available to members of the public. A box of organic (Soil Association certified) veg costs £8, and is ready to be collected from the farm at 6pm on Friday evenings. Once we've shown you where to collect your box you can pick it up on Saturdays too. Half a dozen of our organic free-range eggs can be added to your box for an extra £1.50, or £3 for a dozen. This week's box contains potatoes, onions, tomatoes, cabbage, kale, courgette, chillies, jalapeno peppers, aubergine, cucumber, spring onions, celery, and turnip, all of them grown here on the farm. 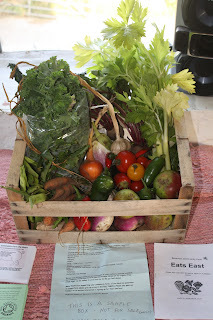 If a weekly (or fortnightly) box whets your appetite, or you'd like to try a trial box, please phone Hugh on 01736 788454.